Tropical Cyclone Riley developed off the north coast of WA this morning and is likely to strengthen over the next few days. 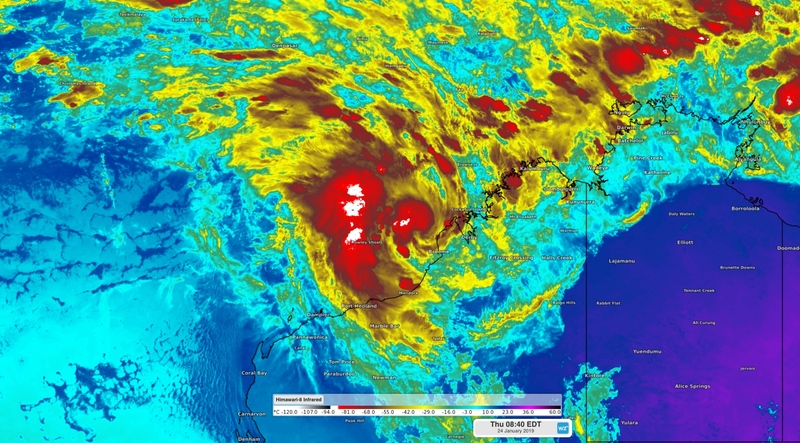 Riley formed about 175km to the northwest of Broome at 5am WST on Thursday, becoming the third tropical cyclone of the season in the Australian region. Image: Enhanved infrared satellite imagery showing newly formed Tropical Cyclone Riley off the north coast of WA on Thursday morning. The system is expected to move towards the southwest during the next few days, roughly parallel to the northern coast of WA, while steadily gaining strength. At this stage, Tropical Cyclone Riley should stay far enough off the coast to prevent any gale force winds from developing on the mainland during the next two days. However, if the system moves towards the south more than expected on Saturday, gales could affect parts of the Pilbara coast. Even while Riley is located well offshore, squally monsoon showers and thunderstorms are likely to affect parts of the Kimberley and Pilbara during the coming days. Visit http://www.bom.gov.au/cyclone/ for the latest tropical cyclone information and http://www.weatherzone.com.au/warnings.jsp for the latest weather warnings.